Updated 2019: Railey beach has got a new hotspot! A brand new street with restaurants and bars has emerged recently. Is has become one of the liveliest places. 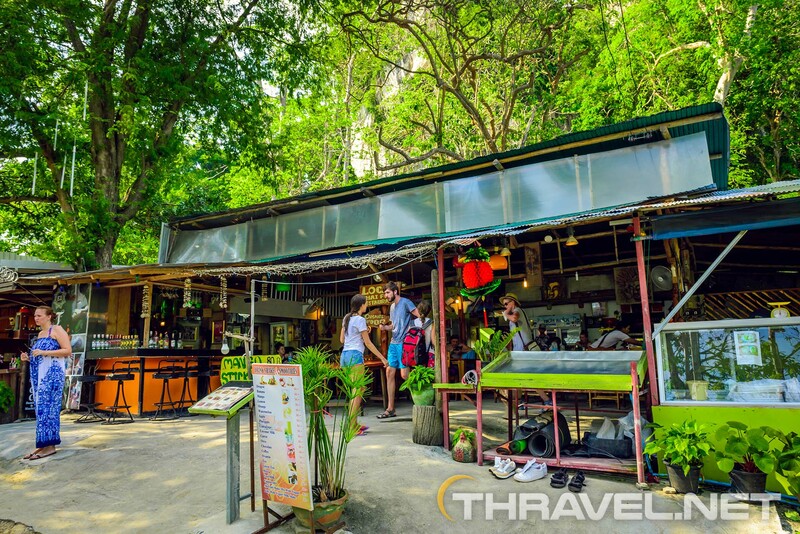 The pedestrian street runs from Railay East beach to the area where Local Thai Food restaurant is located. The area has its own culture. The street boasts many Thai restaurants offering authentic food. Weed can be found in some bars. Some places are designed as open spaces so you can seat on a carpeted floor and have a drink. Others upstairs balcony feature upstairs balcony. The most preferred background music genre is reggae. During Happy Hours cocktails are between 120 and 150 Baht (3-4 euro). The new entertainment area would rival that of the sidewalk near the Railay’s east coast. Thailand has been famous for centuries for an unique cuisine that is rich in exotic ingredients such as spices, seafood, vegetables and fruits. Eating authentic food is always a must when traveling in Thailand. Local cuisine offered in Railay, especially in smaller restaurants, gives tourists an opportunity to experience a specific part of Thai culture and traditions. Railay restaurants are twice as pricey than eateries in Phuket and Ao Nang beach but cheaper than places to eat in Phi Phi Island. In a resort where all products are transported by boats, it is quite normal for the prices to be higher than if you pay for food in mainland. Even mini markets are expensive. Prices are the same or even higher than in hotel’s minibar or in a restaurant. For example, a bottle of wine costs at least TBH 1200 (36 USD). Luckily, during our stay we had found a nice supermarket in Ao Nang offering a bottle of red wine with an origin Chile or Australia for TBH 300 (9 USD). This shop was located on the main street in Ao Nang leading to the Mosque. Here are some of the best places to eat in Railay, Thailand according to the impressions from our vacation in 2017. 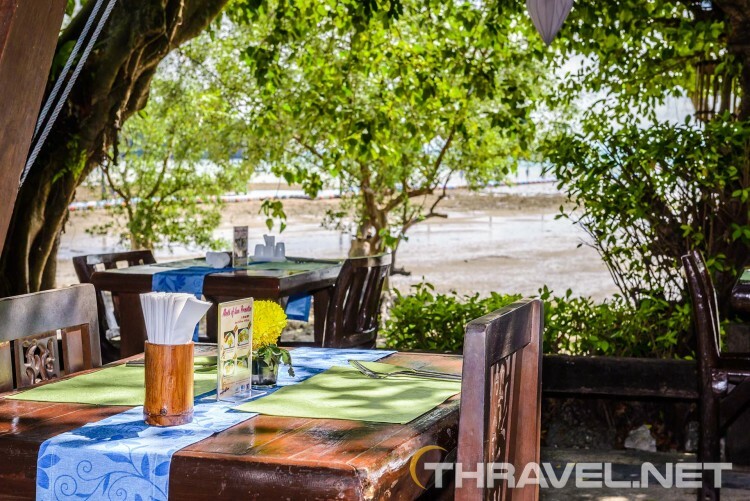 Nestled on the edge of Andaman Sea waters and surrounded by the majestic limestone cliffs of Railay beach, Railay village restaurant is a culinary paradise. Facing the Railay west beach, the restaurant offers perfect sunset views. Guests can dine outdoors on the open-air terrace just few steps to the emerald Andaman Sea. This is a perfect place to taste the authentic Thai cuisine under a starry night sky. Dishes are inspired by typical local flavors blending fresh herbs and spices to enhance food tastes. The Thai a la carte menu features a wide selection of regional specialties with fresh local ingredients. The average price of a meal is TBH 190 (6 USD). Stir fried vegetables or curry meals can be prepared with chicken, shrimps, squid or beef. A portion of steam rice is TBH 30 (less than 1 USD). There is a variety of fried rice priced at TBH 190 – 200 (6-7 USD). The famous Tom Yom soup is TBH 120 (4 USD). If you prefer a variation with seafood then you have to pay TBH 150 (5 USD). A portion of Red curry, Green curry or Massaman curry is TBH 120 ( 4 USD). Deep fried fillet fish is TBH 150 (5 USD). The Railay village restaurant menu is not limited to local tastes. Western food menu includes burgers and sandwiches (TBH 220 – 300 or 7 – 9 USD). A portion fried onion rings is TBH 180 (5 USD). For spaghetti, you have to pay TBH 150 – 300 (6 – 9 USD) depending on products. Of course, you can also opt for pizza. 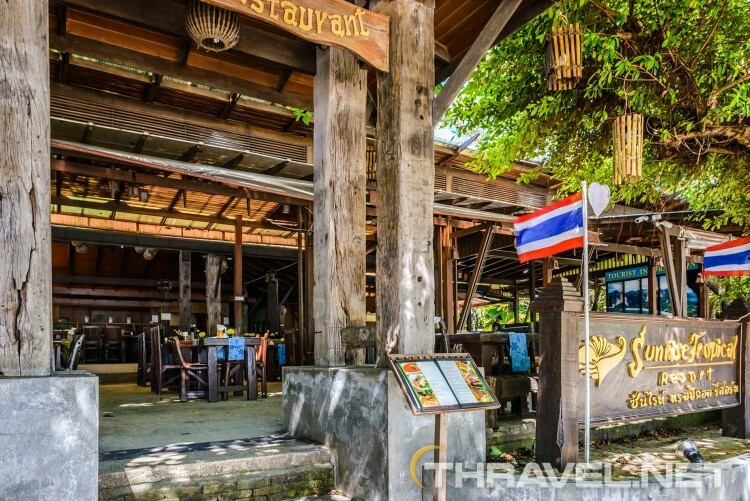 The most expensive meal in Railay village restaurant is a portion of steak – TBH 600 (18 USD). There is also a choice of fresh seafood – red snapper, sea bass and squid. Clients pay per kilo. In Railay village restaurant there is a special section with recommended dishes. It includes prawns with glass noodles as well as raw shrimps in fish sauce each priced at TBH 350 (11 USD). We loved the taste of the Phra Nang curry with a choice of chicken, beef or seafood TBH 300 (9 USD). They serve only nonalcoholic drinks but clients are allowed to buy a beer from the bar next to the Railay village restaurant. Our favorite appetizers were Shrimps sarong TBH 100 (3 USD), deep fried chicken or beef with local sauce TBH 120 (4 USD), spicy glass noodle salad or spicy shrimp/squid salad TBH 120 (4 USD). For a main course, we tried stir fried sweet and sour dishes – TBH 100 (3 USD). The same price were meals such as stir fried vegetables with Oyster sauce and stir fried pumpkins with eggs. You can discover both the nightlife and spicy flavor of Thai cuisine at the complex including the Lucky restaurant and Last bar. You can reach the place by walking to the northernmost end of the East pathway. The Lucky restaurant offers happy hour pricing from 6 pm – 10 pm. You can get Thai specialties for 80 BHT (less than 3 USD). The selection includes– Massaman curry, Green curry, fried rise, etc. The neighboring Last bar is famous with the fire show and Muay Thai tournaments. From 2 pm to 9 pm there is a happy hour for cocktails. You pay TBH 130 (4 USD) instead of TBH 170 (5 USD). There is a live Dj. He is also a singer who plays covers of various songs. You do not pay for the music and fire show but there is a fee of TBH 100 for Thai boxing. The bar also organizes Muay Thai lessons. The years after our first visit to this fabulous place, it is still the most famous of all of bars in the resort. The place obviously has new owners but it still retains the lively ambience. The establishment has been divided into three zones – eatery, bar and boxing area. Almost every hour is Happy Hour at Last bar. Cocktails are 140 Baht (4 euro). The same artist performs live music show. The bar is packed bar with three billiard tables so you can either enjoy the music or the game. No kidding, that’s its real name! We ate here multiple times during our vacation. We had a lot of different options to choose between. Local Thai Food Restaurant was probably the best place to eat in Railay beach. This authentic Thai restaurant had the best curries we tasted anywhere on the peninsula. Restaurant staff were friendly and courteous. The restaurant is located on a quiet place, on the walking path between East and West Railay. It is opposite the Indian restaurant Kohinoor. The place is one of the cheapest on Railay beach. They also offer delicious fruit shakes! The Local Thai Food Restaurant is still dedicated to spicy food fans. No matter the ingredients are brought in by long tail boat, meals are cooked with local products. The portions are large. We recommend all the types of Thai curry, Thai soups (120 Baht or 3 euro), grilled fish especially White snapper (300 baht or 9 euro). Fruit shakes as well as desserts are 80 Baht (2 euro). We had a dinner twice in the Indian restaurant in Railay beach. The food was just as we would have expected – delicious, exotic and authentic. Prices were slightly higher than these in Thai restaurants were. Main courses were TBH 250 – TBH 300 (8-9 USD). They also served crispy pizza but we did not try it. Just to finish the review on places to eat in Ralilay, Thailand, the Wi-Fi was reliable almost everywhere. So, we were able not only to enjoy fresh local tastes under the shade of the palm trees but also share that amazing feeling with our friends in social networks.